Goby Cichlids, Cute little fish with blue lipstick! The Goby Cichlids are adorable little fish covered with bright blue spots, and have beautiful blue lips to die for! If there was ever a fish that could take the role of the aquarium jester, it would be the comical little Goby Cichlid. They are so cute with their blue lips, clownish colors and long bulbous noses. And their antics can’t be beat! They bounce around the aquarium, stopping to perch here and there, and then bounding off again. These sprightly little fish are quite small for a cichlid, give or take around 3″ in length. Because they are so small, they don’t have to have a huge aquarium. But they differ from all others in habitat, body shape, and behaviour. These cichlids come from Lake Tanganyica, Africa where they live in shallow waters close to the shore. Here the waters continually surge across the rocky rubble. The substrate is rich with plenty of healthy algae growth which houses small crustaceans and insect larvae. These small fish have a few adaptations that enable them to maintain their position in these fast moving waters and feed with relish. They have a greatly reduced swim bladder, so have little buoyancy. Their pelvic fins are position downward and have stiff spines. This allows them to perch and cling to the substrate, maintaining their position in the surging waters. Using specialized grazing teeth, they pick and scrape at the stringy algae for tasty morsels of food. The Goby Cichlids have no natural aquatic predators but they are at risk from predatory birds. Their speckled bodies which can readily be seen in the aquarium, create a wonderful camouflage in the wild. As they forage the substrate with their snout-like mouth they use their eyes, mounted high on the head, to keep an eye out for airborne dangers. These interesting little fish are truly comics in the aquarium. They are fun to watch as they hop around the bottom of the aquarium, and are pretty friendly too. Friendly that is, with other mid-dwelling fish that aren’t to large or boistrous! They just don’t get along too well with most of their own kind. A pair works fine though, and they are easy to breed. If you’re looking for a unique cichlid, these guys could be just the ticket. There are only five species with four of them sometimes found in the hobby. Each has its own little differences, so check them out! This fish is the smallest of the group, reaching only about 2 3/4 inches in length, and has the most pointed mouth. It is also known as the Jeweled Goby Cichlid, or Speckled Goby Cichlid. This guy is the largest of the group. Though the females are smaller at 2 1/2 inches, the males get up to 4 inches in length. Though not a brilliantly colored as its relatives, it’s still really pretty with its electric sky blue spotting and blue tinted lips. This is a fascinating fish. It will reach just over 3 inches in length and has a bluish cast to its body. It’s topped with bright blue and orange spots and has brilliant blue lips. 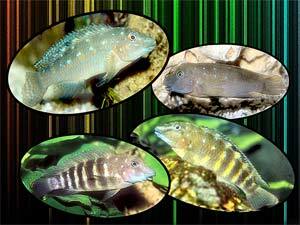 It will also be called the Blue-Spotted Goby Cichlid or Blue Lips Goby Cichlid. This is truly a clown and one of the larger gobiesat around 3 1/2 inches in length. With outlandish blue tinted lips on a puckered mouth, it’s definitely a favorite. It may also be called Striped Goby Cichlid, Horse Nose Cichlid, Striped Clown Goby, and Tanganyika Clown. Gobies and other African Cichlids, Dwarf Cichlids, and the large cichlids from Central and South America are fascinating fish and fun to keep. Pictures and information for all kinds of different cichlids can be found in Types of Cichlids!